The Pros And Cons of cloud computing...a versatile and effective stock photo about online computing. Cloud computing has become a hot topic in the business world, and any company or consultant who wants to gain exposure for their cloud computing products and/or services will need visually compelling content whether that content is for a magazine ad, social media post, or website. A review of the pros and cons for cloud computing is a great way to introduce the benefits of online computing and the particular positives (and negatives) of individual products and services that relate to online computing, networks, and Internet enterprises. 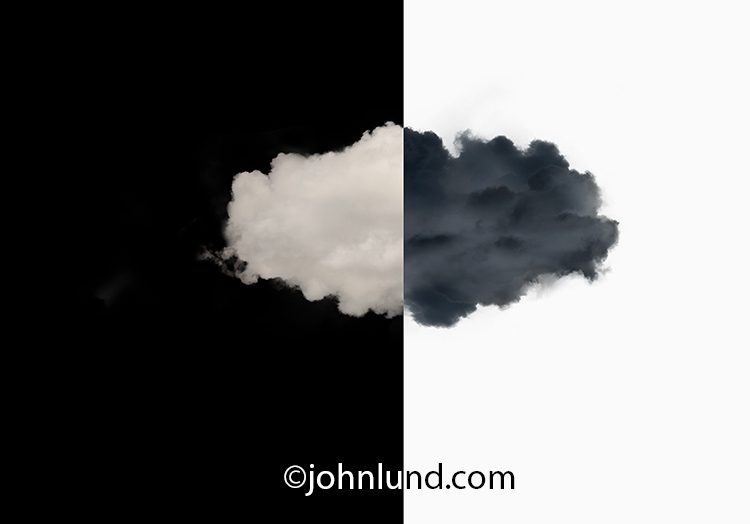 It was with the above in mind that I decided to create a simple a graphic image that would be an obvious “cloud computing” image and, in this case, also an obvious “pro” and “con” image. The undertaking was actually pretty simple, though a bit painstaking. The “painstaking” part was creating a single cloud that would represent cloud computing. I used several shots of clouds stripping out cloud parts and assembling them in Photoshop. After that it was easy enough to past the cloud onto a black background. I then selected half of the image and inversed it. Presto…a cloud computing “positives” and “negatives” stock photo. As an added plus the image also brings to mind the idea of Yin and Yang and balance. I also believe that people who view the image will have that Ying/Yang idea pop into their minds and thereby have a subliminal and positive force working on them. The image, by being on a simple white/black background offers unlimited cropping options and ample copy space. Copy and headlines can be reversed out of the black, or printed black on the white areas. I think it would be fun to see a headline that stretches across the top, reversed out of the black AND printed in black over the white. Because I think the image can be used often and by many, I uploaded it to the stock agency (Getty Images in this case), as a Royalty Free (for those of you not familiar with the term…that does NOT mean free) image. I have to Write My Dissertation For Me on Cloud Computing is that some kind of data storage or what is it? Good thing but being a coursework writing services expert, I think that pros are more than cons that make the service trustworthy. There are lots of people who talk about cloud computing and also most of the businesses using cloud computing it gives them good cost management and also reduces the cost of managing maintaining IT System i also do my assignment online uk on the cloud computing what are the pros and cons of cloud computing. I am working as an academic writer at Best Dissertation Writing Services UK & providing writing assistance to the student who needs any type of academic writing help in their educational career. Do you want to get amazing Ireland Assignment Help services? Don't go else and just come at StudentsAssignmentHelp.com and get the best kind of academic writing help. We have a team of proficient Irish assignment writers that complete an accurate assignment writings for the scholars. The best part about hiring British Law Dissertation Help to help out with your work is that you can be absolutely certain that any assistance you get will be professional, delivering work that meets all the standard requirements of any UK based educational institution. UK Essay Writers gives you just that. An expert photographer may be a representative, for instance of a paper, or may contract to cover a specific arranged Online Assignment Help London occasion, for example, a wedding or graduation or to illustrate an advertisement. Edward Samson is a Social Media Marketer, Educator, and a Blogging Cheap Dissertation Writing Services UK Expert. A veteran digital media marketer and an accomplished educator, He has built a reputation as among the best education technologists in academic circles. He is an ardent reader of books on technology, education, and business. You can find her on Google+, Facebook, and Twitter. We offer the best essay help services. We convey the best paperwork to every one of the understudies at a sensible cost. Likewise, we remember the arranging style to be utilized in your paper. Along these lines, obtain the best essay composing assistance from our specialists. I have worked on the presentation of cloud computing with the help of presentation services. It covers a large number of services like the cloud backup and Gmail application. In my presentation, I mainly cover the applications which are used mostly by everyone for the entertainment purpose, in which I talk about the Netflix which totally relies on cloud computing services.